Joris Timmers is a Director at Accuracy. He has extensive experience in the fields of transactions, valuations and disputes in national and international context. Joris has worked with (international) corporate and private equity clients across a wide range of industries, with a particular focus on waste management services and energy & utilities. Joris’ experience encompasses a wide range of advisory projects across Accuracy’s service lines, dealing with transaction services, dispute services, valuation analysis and decision-making projects. Joris worked domestically and internationally, across Europe and the Middle-East. 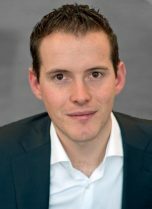 Prior to joining Accuracy in 2011, Joris gained experienced in M&A advisory and valuation at a Dutch boutique firm. Transactions: buy-side due diligence, sell-side due diligence, SPA reviews, business plan preparation, cash forecasting and closing adjustments. Valuation analysis: Litigation and arbitration support, fairness opinions and for M&A purposes. Decision-making projects: cash flow optimization and management reporting support.